1 doz. David Austin 'Patience' (Auspastor) roses 9.5 - 11 "
1 doz. 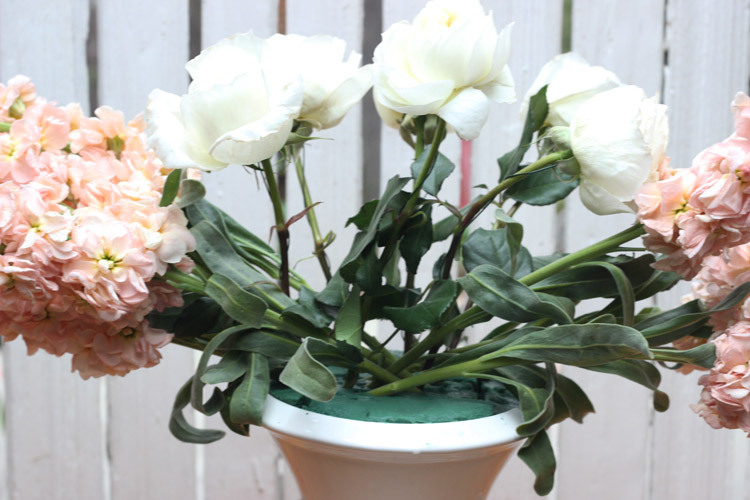 'Garden Spirit' roses ( light pink and white with green edges-showy) 9.5 - 11"
7 showy pink roses from a garden bed 6.5 - 7.5 "
18 gauge wire cut into thirds. 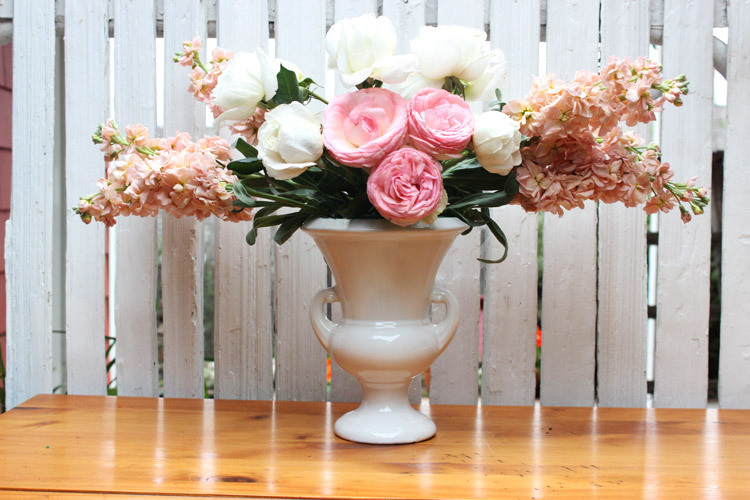 a white classical urn 9" H x 7" Diam. David Austin Roses...give them just because...because of their beauty and incredible fragrance. 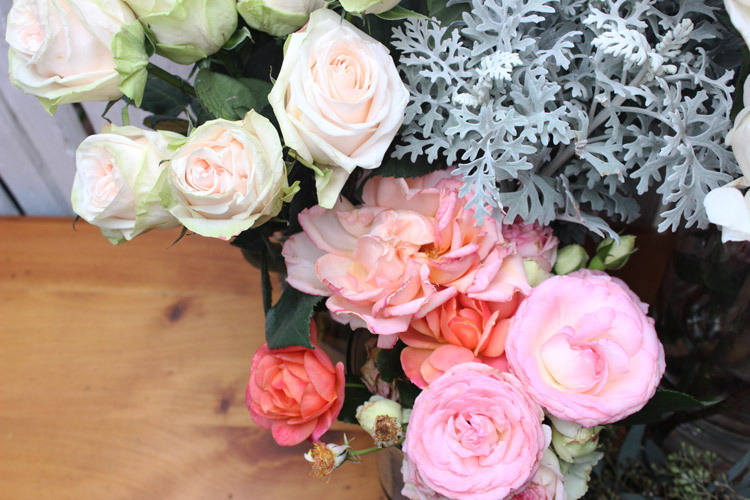 Arrange them with 'Garden Spirit' roses. 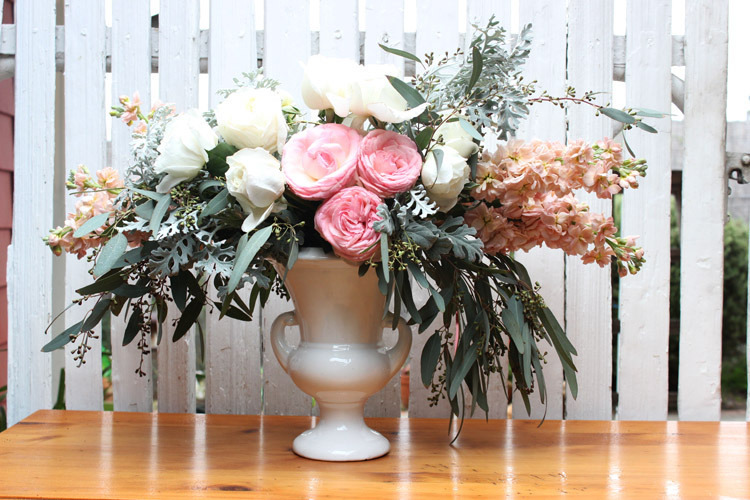 Accent them with pink roses from a friend's garden bed, stalk, 'Seeded Eucalyptus' leaves, and 'Dusty Miller'. The 'Seeded Eucalyptus' drapes beautifully over the white classical urn. The 'Dusty Miller' adds a velvet look and texture. 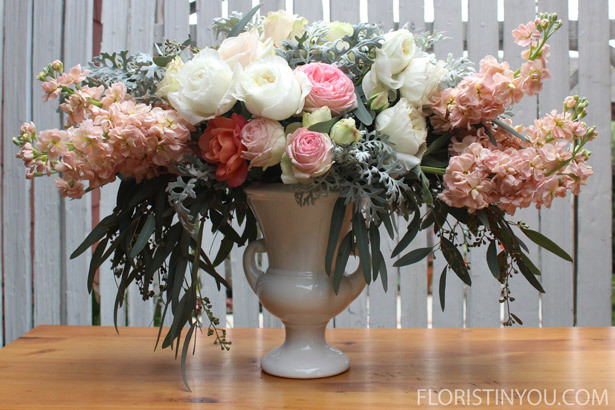 The stalk in this arrangement ( the champagne colored flowers on the sides) is used primarily as a soft structure, to build the arrangement out horizontally, so instead of being built up, this arrangement is built out with a rounded curve at the top. The hues in the pallet are very soft; soft grey greens, soft champagne pinks, pure whites, with a focal point of pink in front and in the back. 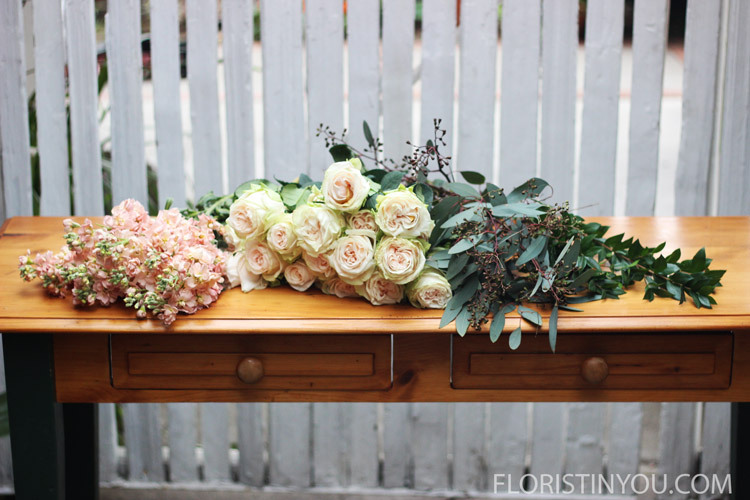 This arrangement could be used as the main arrangement for many types of events. It is romantic, refined, and symmetrically balanced. Well are you ready to build this? Fasten your seat belts, and here we go. 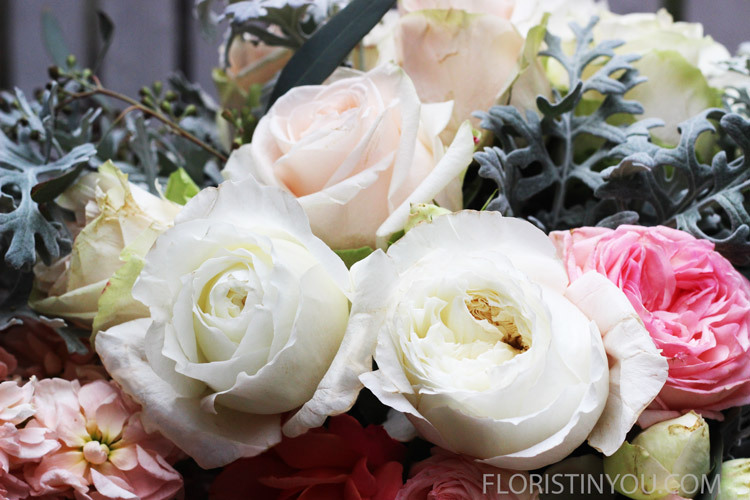 You will use champagne stalk, 'Garden Spirit' roses, & 'Seeded Eucalyptus'. Wire 'Garden Spirit' roses using 1/3 piece floral wire. Wire garden roses (bright pink, lower right) using 1/3 piece floral wire. Use produce knife and shape wet pack to fit into vase. Push into vase and cut top level with top of vase. Press top of urn into foam to get shape, then cut. 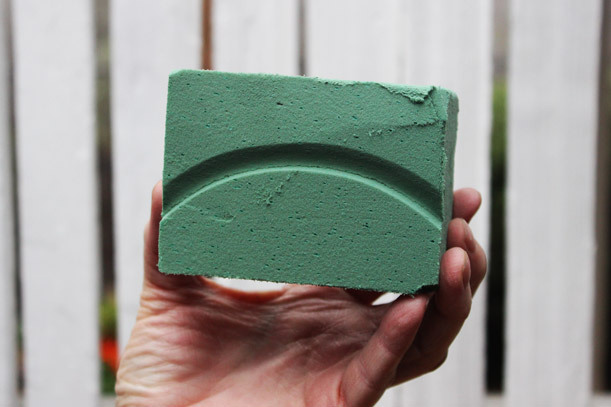 Use shape as pattern and cut three more pieces. Fill pitcher with water until it won't accept any more. It will take a lot! Cut 6 stems of stalk to 16.5 inches and strip off bottom leaves. Insert 5 white roses that are cut 11" long for center, 10.5" sides, and 9.25" by the rim. With one on each side in front, at 9.25",1 at 11" for top, 2 at 10.5" sides. Put 3 pink garden roses in front, low, as focal point. Add 'Seeded Eucalyptus' 14 - 16" top and sides, 8" in front. Add 'Dusty Miller' 16" center, 9.5" top, 7" front. Fill in with 'Garden Spirit' roses 9.5 - 11". Add bright rose in front. Close up after 'Garden Spirit' roses are added. The roses look like a chiffon gown, and their scent is heavenly. Congrats! You are done. Enjoy.